Shawn Miller and I went out to Yanbaru very early this morning for a birdwatching tour with birder and wildlife artist Ichiro Kikuta. Ichiro has just started offering guided birding tours, either 2-hour dawn tours from 6AM to 8AM, or all-day tours. He can speak some English, is very personable, and has a huge wealth of knowledge about Okinawan wildlife. Shawn and I specifically wanted to see the Noguchi-gera, the rare woodpecker that is endemic to the subtropical forests of northern Okinawa. 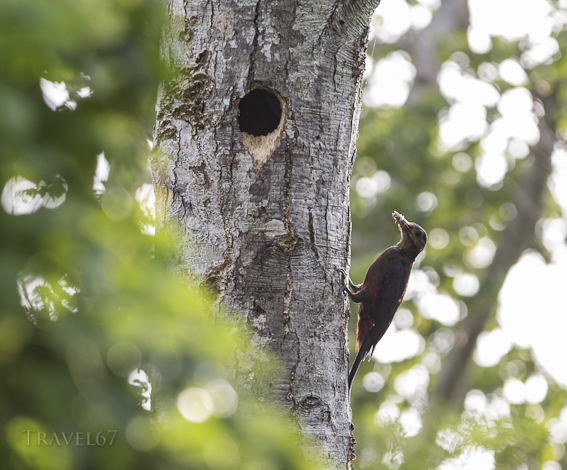 Ichiro knew where a pair of the woodpeckers were feeding their chicks, and guided us to the nest. We spent a couple of hours photographing this particular bird, while Ichiro identified other species of birds we spotted or heard. 2-hour dawn tours are ¥6,000 per person. All-day tours for one to four people are ¥¥18,000 (1p) ¥24,000 (2p) ¥30,000 (3p) ¥36,000 (4p).